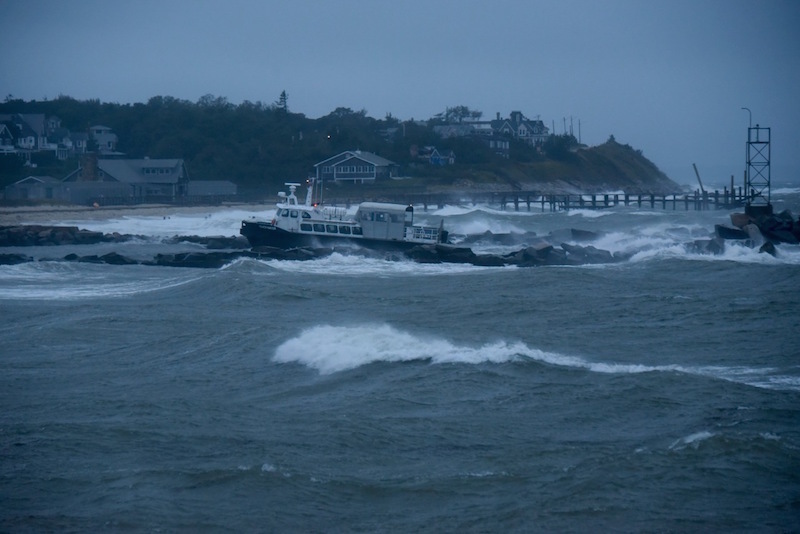 Seaworthy ferry Quickwater makes the rough passage into Oak Bluffs during storm last week. Cottage City Oysters hopes to boost production next year with a new upweller, where baby oysters can get a head start before being transferred to cages at the bottom of Vineyard Sound. The Oak Bluffs selectmen on Tuesday approved the upweller, which will occupy a raft in Lagoon Pond from around June to September. Tidal currents will help distribute the oysters inside the upweller and keep them well fed for the season. The oysters in turn will help remove excess nitrogen from the pond, which suffers from algal blooms in the spring. The town shellfish committee suggested removing the upweller in late summer or early fall to avoid scalloping season. “I think that’s a great compromise,” said Dan Martino, who launched Cottage City Oysters with his brother Greg in 2014. Mr. Martino is also a member of the shellfish committee. Cottage City Oysters imported about 500,000 seed oysters last year and plans to increase that number to 750,000 in the spring. “We can’t grow enough oysters right now to meet demand,” Mr. Martino said Tuesday. The final product ends up at private culinary events, the Net Result in Vineyard Haven and elsewhere on the Island. The selectmen voted unanimously to approve the upweller, with dates to be approved by the shellfish committee. Mr. Martino said he would recuse himself from those discussions. In other business, the selectmen said they were glad that tropical storm Jose, which stalled east of the Vineyard last week, did not cause more damage in town. Selectman Greg Coogan noted the importance of fuel and electrical infrastructure in areas affected by hurricanes, and expressed concern for communities farther south that were hit by hurricanes this year. He recalled Hurricane Bob in 1991, only a category one storm which left the Vineyard in tatters for a few weeks. “They will be suffering for months,” he said of the communities most affected by hurricanes this year. He said the storm caused no major problems in Oak Bluffs, other than a few lost days of work and people getting stranded on either side of Vineyard Sound. A written report by Oak Bluffs fire chief John Rose will be available to the public. Selectman Michael Santoro credited Eversource Energy for keeping the lights on during the week, noting the company’s efforts to reduce outages on the Island, including by keeping power lines clear of trees. Stormy seas pushed some of the cages at Cottage City Oysters toward Eastville Beach, but Mr. Martino said the cages have all been recovered. Town administrator Robert Whritenour gave an update on an open meeting law complaint filed by MVTV videographer Lynn Fraker in August. In response to the complaint, the town distributed copies of the state Attorney General’s open meeting law guide to the selectmen and the MVTV staff to help improve communication. The complaint centered on an August 8 selectmen’s meeting that began in executive session. The videographer on duty had been told to leave the room before the meeting was called to order, according to the complaint, which also notes that the executive session had been extended half an hour while people waited outside the room. In a letter to the office of the Attorney General this week, town administrator Robert Whritenour said the case was a matter of miscommunication. He said the videographer on duty had been informed by selectman Kathy Burton that the meeting would go into executive session, but had taken that as a directive to leave the room. “As a result, MVTV did not film or broadcast the opening of the meeting,” he said. “The board hopes that this issue enhances the level of communication among the video staff and the board and that any issues or questions are raised on the spot so that they may be corrected,” he said. Mr. Coogan reported that the second annual Martha’s Vineyard Craft Beer Festival went smoothly on Saturday, despite some apprehension by town officials who had criticized last year’s festival. He said town police had reported favorably, although he planned to get a full update in the coming days. The selectmen’s next meeting is Oct. 10. Wasn't there discussion about the sinking barge in Lagoon Pond? Seems like that could be a real threat to fishery.